Until within a few years ago, the popular method of bottling fruit was by placing the jars containing the fruit in a saucepan, with hay round and under them, to prevent them from cracking when the water in the pan boiled. The length of time for cooking the various fruits was decided by guesswork, sometimes with disastrous results. Now, however, by purchasing a very simple apparatus, fruit, vegetables, etc., can be preserved by a scientific and reliable process. Thus an enterprising housewife can stock her storeroom shelves with a splendid variety of foods, thereby saving much money and time, and ensuring a good supply always to hand for emergencies. There are several excellent kinds on the market all more or less simple and easy to use. It usually consists of a strong, well-tinned outer vessel to hold water, with a tin-cased thermometer which passes through the lid, and can be seen from the outside. 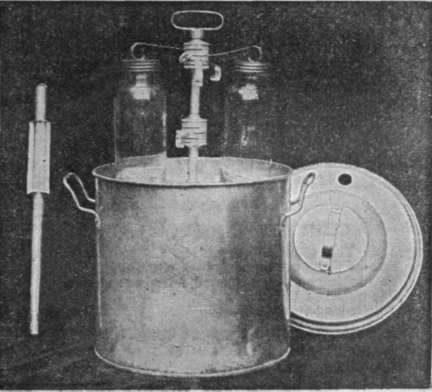 There is also an inner stand, with a handle on which the jars are placed when filled. 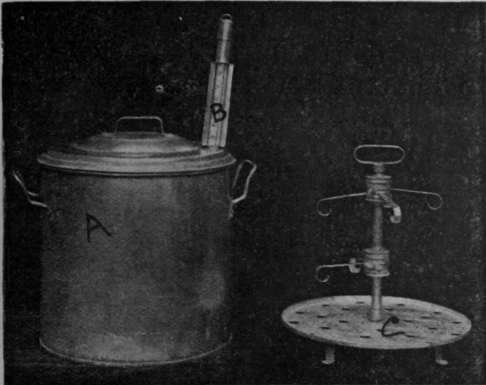 The stem of this stand is fitted with two movable round plates containing slots into which the metal springs are fixed; the other ends of these pressing strongly on the centres of the lids of the jars. Some makes have no inner stand, the bottles being put directly into the outer vessel. The price of the apparatus, with one dozen jars, varies from 15s. 9d. to about £2 10s. The one illustrated cost 15s. 9d. Jars of different shapes and sizes can be bought for different foods; tall straight ones for fruit and vegetables, and others short and wide-mouthed for fish, meat, etc. If preferred, the apparatus can be bought without jars, while extra ones may be procured from 3s. a dozen. When these jars are not required for preserving, they are most useful for jams or stores. After opening and emptying a jar, clean it and the rubber ring very carefully; the latter should be washed in lukewarm water with a little soda, then rinsed in cold, and stored in a cool place. Never use rubber rings which have holes in them, or which smell musty, or the preserve will acquire a musty flavour. If the metal springs, etc., are not to be used for some months, rub them over with a little vaseline to prevent rust. Jars with pieces chipped out of the lids or rims should not be used, for they will not be perfectly air-tight. Never attempt to use any fruit, vegetable, etc., which is not perfectly sound and of good quality. All fruits and vegetables should be freshly gathered, not over-ripe, and quite free from bruises and discoloration. Wash the fruit very gently, then prepare it in the usual way by removing stalks, etc. Stone fruit may be halved, stoned, and peeled, though the shape of this fruit is kept better if the peel is left on. By dipping unripe peaches and apricots into boiling water for a minute or so, the skins can be easily removed, but great care is needed, as the outside very quickly becomes soft and pulpy, thus spoiling the firm appearance of the fruit. Be very careful not to touch the fruit with steel of any kind, especially apples and pears; use silver knives and electroplated spoons. Unless this is done the colour will be spoilt. Endeavour to have the fruit of "as much one size as possible, pack it carefully and neatly into the jars, so that a good effect is gained. Fill the jars either with cold water, or, in the case of fruit, a simple syrup. For the syrup : Allow three quarters of a pound of loaf sugar to each pint of water. Put the sugar and water in a pan, and let them boil fast for five minutes with the lid off the pan. Then pour the syrup into a basin, and leave it until it is nearly cold. Water will do, but fruit is improved in flavour if syrup is used. Sugar can, of course, be added to the unsweetened fruit, but the effect is never the same. Do not fill the bottles quite to the top, as this often causes the contents to rise to the top of the syrup. After filling the jars, lay a rubber ring on the under side of a glass lid, place this on a jar, and then put on a metal screw-cap and screw it tightly down. Place the jars on the inner stand, fix the metal springs into the slots between the two movable plates on the middle stem. Place the other end of each spring on the lid of a jar. Press the "plates" down as far as they will go, so that pressure is put on the lids, and screw the little plate in the desired position. Next lift the stand and bottle into the outer vessel, and pour in enough cold water to cover the bottles. Put on the lid. Heat the thermometer for a few seconds in warm water, put it into position, and bring the contents of the boiler slowly to the necessary degree of heat, and keep it at that for the time required, which will vary with the kind of fruit, etc. When the cooking is done, draw the vessel aside, and leave it for ten minutes. Then lift out the bottles, and let them cool slowly in a place free from draughts; they should never be placed on the floor. When lifting the bottles from the water, see if it is possible to screw the metal tops any tighter, and if so, give them an extra turn or two. Store the jars in a dark, cool place. Note - Only foods which need the same degree of heat and length of time should be sterilised at one time. Be sure and keep the degree of heat even, and for this, of course, the fire needs careful management. N.B. - F. = Fahrenheit; C. = Centigrade; .1oo° Centigrade = 212° Fahrenheit, which is fast boiling point.